Welcome to my fitness newsletter! 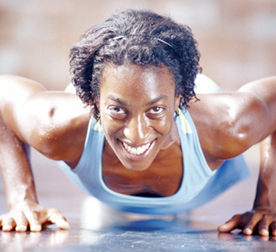 I have fitness tips to help you live healthier and happier! In this issue, I address a common foot injury called plantar fasciitis. I'll help you prevent this injury and show you how to treat the pain so you can return to your fitness routine quickly! I don't want plantar fasciitis to stand in the way of your fitness program! So let me share my best strategies to prevent this condition--and alleviate the pain if you get it. 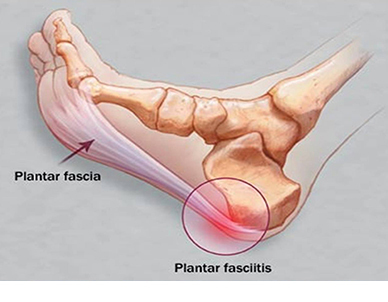 Plantar fasciitis is an injury to the plantar fascia, a band of connective tissue on the underside of your foot. It runs under your heel and continues under your arch to your toe joints. The fascia can develop tears and become inflamed. Plantar fasciitis usually results from improper foot mechanics and tight fascia. Pain is most commonly felt under the heel but can occur anywhere along the underside of the foot. Plantar fasciitis often causes a sharp, burning pain when stepping out of bed in the morning or after being seated for a while. Below are my six best self-care strategies to prevent plantar fasciitis and ease the pain it causes. If these tips fail to work, you'll need more aggressive measures from an orthopedist. To prevent plantar fasciitis, you must wear shoes that provide arch support and keep your foot in a neutral position. You don't want your foot to roll inward or your arch to collapse. This is called pronation. To stop your feet from pronating, you may need an orthotic device that fits into your existing shoes. Decent orthotics are available at running-shoe stores, but better quality ones can be custom-moulded to your feet by an orthopedist. 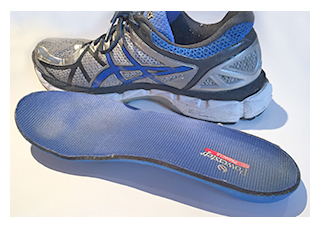 Please avoid the orthotics sold at any other store except running-shoe stores. You may need both orthotics and specific shoes that keep your foot in a neutral position to prevent pronation. If you need to wear orthotics in your shoes, first remove the inserts that came with your shoes. Don't walk barefoot, in flip flops, or loafers. Always wear supportive, lace-up shoes (with your orthotics, if needed). Some doctors recommend that you wear shoes even when getting out of bed at night to walk to the bathroom. The general idea is that you do not want to re-injure the plantar fascia and interfere with your healing process. Active people should buy new athletic shoes 2 to 4 times a year because the support and cushioning in shoes will wear out. If you have old shoes, get a new pair soon. 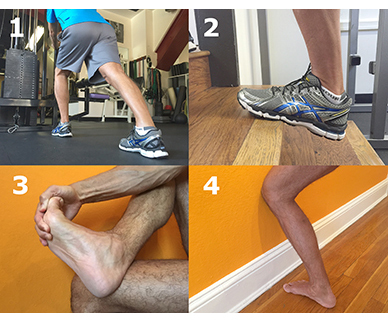 Stretching is important to lengthen a tight plantar fascia. This will allow it to move more freely in your foot and reduce irritation. I want you to hold these stretches for 1 minute and do them several times a day. Put your hands on a stable wall or column and put your leg back as far as it will go. Keep your back leg straight and press the heel into the ground. Stand on the edge of a step and let your heal sink toward floor. While seated, cross one foot over the opposites knee and pull your toes back, especially your big toe, until a stretch is felt. Stand with the affected foot about four inches from a wall. Hold the wall with your hands. Bend the knee and try to touch the wall with your knee while keeping your heel on the floor. If you can't reach the wall with your knee, move the foot forward a small amount and try again. Massage helps loosen the tight plantar fascia which can become irritated. Use your fingers to massage the tight band of fascia under the heel and arch of your foot. It takes a lot of pressure to loosen the fascia, so be aggressive. You can also use a hard ball, like a lacrosse ball, to massage the underside of your foot. While seated, roll the area under your arch and under your heel. Icing plantar fasciitis reduces inflammation. Ice the heel and entire underside of your foot for 20 minutes a few times a day. Even better, you can massage your foot with ice. To do this, put a small bottle of water in the freezer. 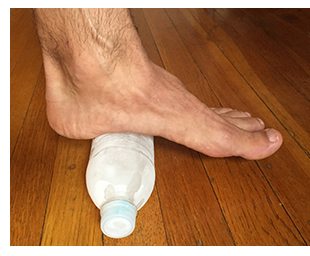 Then place the frozen water bottle on the floor and roll your foot and heel on it. 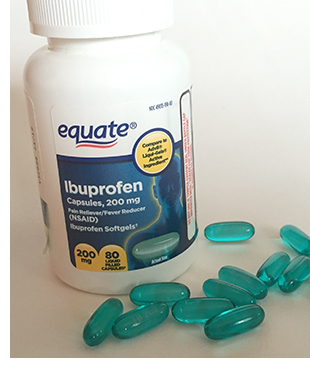 To reduce pain and inflammation, take an over-the-counter NSAID (non-steroidal anti-inflammatory). These medicines are Ibuprofen (Advil), Naproxen (Aleve), or Aspirin. Take with food to prevent stomach irritation. To allow your plantar fasciitis to heal, take a break from any activity that causes pain. Switch to non-impact exercises until your foot is pain free. Safe activities include swimming, biking, yoga, seated or lying leg strength training, and upper body strength training. 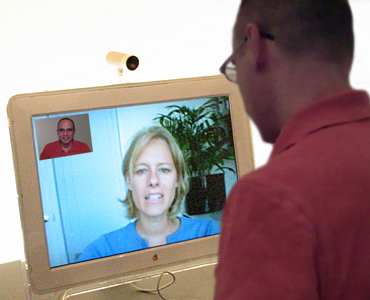 Earn FREE Sessions! Get a friend into fitness, and earn free training sessions with me at the same time! I'll give you a free training session for each new client you refer to me. © Copyright 2015, Steven Reichert Inc. All Rights Reserved.